Simple, minimal designs with the available space and attractive colour contrasts with the love for light – you’ll not need a better expression than this bathroom for it. 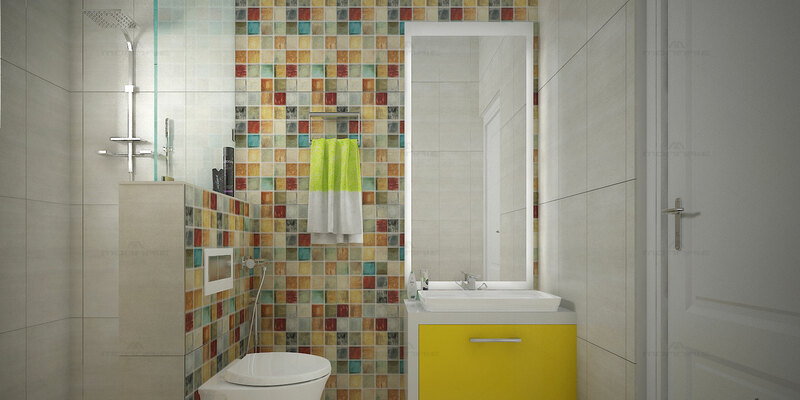 When textured tile/ceramic blocks align the contrast well the yellow shade of colour is a bright rejuvenation. The flat wash basin with broad base is a new and innovative add on. This makes sure of the minimal water consumption and towel railing is a feature to enhance simple but modern tastes. The small stand for the goodies and the flat broad shower head is a view of luxury and simplicity at one look. Anyone who is not so sophisticated and require elegant outlook will fall for such an awe show.